We had the chance to review Daniel Boone: Frontiersman from the Heroes of History series by YWAM Publishing including both the book and the Unit Study Curriculum Guide. We began this book as a read-aloud with me reading to everyone in the van, but my son soon was far ahead of us as he read more and more on his own. He enjoyed reading this paperback book, and picked it up to read often. It is a book with relatable examples from this hero's life without painting a perfect picture. We temporarily misplaced the Heroes of History Daniel Boone book and attempted to replace it with a library book so he could continue the study until we returned to the 4H building, but that change quickly revealed to us the superior quality of our book from YWAM Publishing. My son said (of the library book) "It just started with him out in the wilderness and didn't even say anything about his childhood." He was ready to return to 4H and reclaim the book that he left in their meeting room! He said that the YWAM Daniel Boone book "told the whole story." Janet and Geoff Benge's 215 page book covers the entire life of Daniel Boone. A video author interview is included in the curriculum guide. The Unit Study Curriculum Guide was provided as a CD, but those are being phased out. All of their unit study guides are available as downloads from the YWAM website. This was multifaceted covering geography, social studies, language arts, music, Bible study, and more. Hands on activities made it more fun for my son, though there are essay options, too. Though my son read the book independently, we worked through the lessons in the curriculum guide together. I easily opened it on my Windows computer, and my son read, watched, and discussed it with me instead of writing. I want to share heroes with my eleven year old son, for him to see men of character. To have heroes who have devoted their lives to God provides such a better foundation for him than cartoon superheroes. This book did that and makes me want to read more like it. Other titles include Ronald Reagan, Christopher Columbus, Abraham Lincoln, Davy Crockett, Billy Graham, John Adams, Theodore Rosevelt, William Wilberforce, Clara Barton, William Penn, Meriwether Lewis, and many more heroes from history. 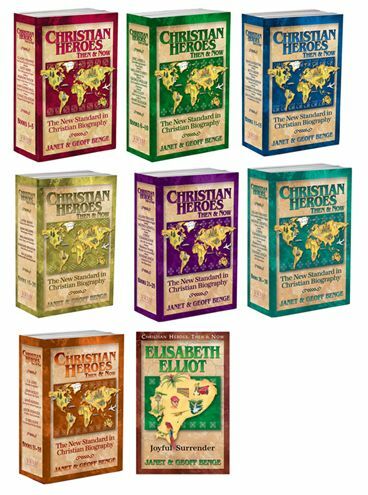 Missionary stories and heroes in the Christian heroes then & now series feature George Müller, Amy Carmichael, C. S. Lewis, Corrie Ten Boom, Gladys Aylward, Hudson Taylor, Jim Elliot, Bethany Hamilton, and many more. This was a very well written and enjoyable story. We have enjoyed books by YWAM publishing in the past, and we want to read more of these historical biographies and missionary studies. The study guide was like icing on the already delicious cake; it added to my son's understanding. They also offering books which I want to try out. Click below to read reviews of other Schoolhouse Crew Review members including Heroes of History and Christian Heroes: Then & Now titles.